This day belongs to ayano. "I've been supporting and enjoying this project from Japan. Looking forward to the second year!" You still aren't running out of ideas! The team have notched things up a bit as you head to the finish line. Very impressive line up of LBDs from around the world on facebook, and I saw UP gets a mention on frisky web site. joybd tagged this Tres chic! Absolutely amazing!! Love your creativity, love the tribute. incredible!!!! and the outfit is lovely... fantastic!!! so creative! could it be only 6 more days? wonder if you will wear every color but black for a while! Have enjoyed this thoroughly...the dresses & the project. I love Rene Magritte, and i love how you have incorporated it! is Renée ^.^ Stellar job lover, can't wait to see Magritte in stop mo! This is sooo awesome... love it!! Brian Wonderland tagged this it Bes! Photo #3 is AWESOME!! Davy has SKILLS! Such a fun way to round out the year; can't wait to see what Day 365 will be! Quite possibly my favorite day. Love the concept and the execution. So sad but so excited for the final countdown. Going out with a Bang! This is just way too cool. I bet Magritte would have loved it too! I can't say that I am at all fashion conscious, but your creativity has been a bright spot after many a long, hard day at my school in NYC. Congratulations on an inspiring project. Your Magritte look is wonderful. The image editing makes it breathtaking. What an adventure I have been watching. Every day a different response - light-hearted, tongue-in-cheek, business wearables, haute couture, costumes, grunge, avant garde. ball gowns, ethnic designs, of course vintage and now surealism, All with a little black dress that was meticulously, precisely designed to be worn on its own or altered with assessories from around the world. Dreamsocks, generous friends, up and coming designers, jewelers and your encouragers were all part of it. Brilliant choices of color, a real eye for shape, a whimsical plan for the complete presentation. I always had a reaction - a sigh for beauty, shock, giggles, a 'how clever'. being spooked, an 'ah' for the petite little girl. It was a honorable goal and you, the students and your audience are honored by your idea. I will miss you. You took the vision to the moon! Thanks for letting us be a part of this exciting project. Photo 1 is what I'm planning (yes, I plan early...) on dressing up as for Halloween this year! I can't decide if I should paint an apple on my face, or design a hat that has an apple hanging off the front of it. you are my favorite. this is my favorite. it made me smile so big. This is excellent! What a great finish! Wow! So in the last 359 days I've learnt about Akanksha, sustainable fashion, ethical fashion, Herman Wallace, Right Rides, shopping, style...and so much more. Today, I've learnt about Rene's Son of Man. Thank you. Amazing! So thrilled to see that an already incredible concept has grown into a highly complex, intellectually stimulating yet fundamentally altruistic community. OMG, I love it !! Thanks for my first laugh of the day, this is amazing !!! Words cannot even describe how much I love this. Maybe I should make some up - that'd be appropriately surrealist. Today is shlurgling. I love it ! It't so cute ! ^^ And I like René Magritte very luch ! He's a great painter ! speedy tagged this oh wow! sheena it just keeps getting better! René is my fave surrealist! brilliant! Jose Mofongo Ayala tagged this Increible! how you do that? nice one, guys! I am so sad I only found this blog today! What a marvelous idea. Having been an art student in the 70's and making all my own clothes at that time, I am so impressed and awed by your project. The ideas are brilliant and your 365 variations are stunning...I wish I'd thought of this...so happy you are doing this now, when we really need to shift our focus. the UP running for a second year?!? now THAT'S a fantastic idea!!!! Fab! How about a year of artists? Lauren Hawkins tagged this Amazing!!! Fantastic! So well done and the outfit looks really cute, too! That picture always reminds me of The Thomas Crown Affair - one of my favorite movies - just amazing. You never disappoint. Only one more week, then what? For 359 days I have been waiting for you to do this one haha. I am so happy now. i've got a card with the "le fils de l'homme" that obviously inspired the first photo, on my desk! this one is pretty awesome - i love the outfit and the idea even more! 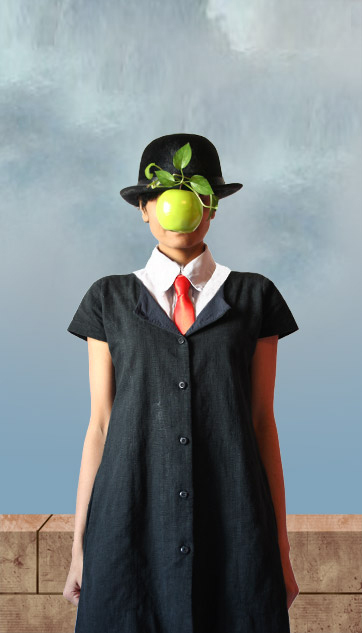 Towards the end of the project, Sheena, you are giving us the best- in style,creativity,art&fashion.What a tribute to Rene Magritte....You have done it so well.How can you stop stimulating your fans with your creative skills and ideas? You have to continue your site with something else,now that you can wear any colour in 6 days. I am sure you won't disappoint your faithful fans. That is absolutely unreal! Amazing. This is good... really, really good!!! This one is probably the most creative from your collection!